Nerve gliding exercises encourage the nerves to glide normally as you move your joints. A nerve will not glide if it is injured. Therefore, nerve gliding exercises are often used post-surgery or as part of a rehabilitation program from an injury. Common areas for exercising include the hands, forearms and neck. Pressure on the ulnar, median or radial nerves of the arm may be relieved with nerve gliding exercises. Pressure on the ulnar nerve can result in a tingling feeling in the little and ring fingers of the hand or the elbow. A nerve glide exercise you can do as part of an ulnar tunnel program involves standing tall and holding the injured arm next to your side. Bend your wrist so that your palm to faces the ceiling and bend your elbow slightly. The wrist may be kept in neutral if bending the wrist is too painful. Lift your arm toward the ceiling as high as you can until you experience more tingling in your hand or elbow. Drop your arm about 20 degrees and tilt your neck toward your opposite shoulder. Straighten your neck and then tilt it again twice more. 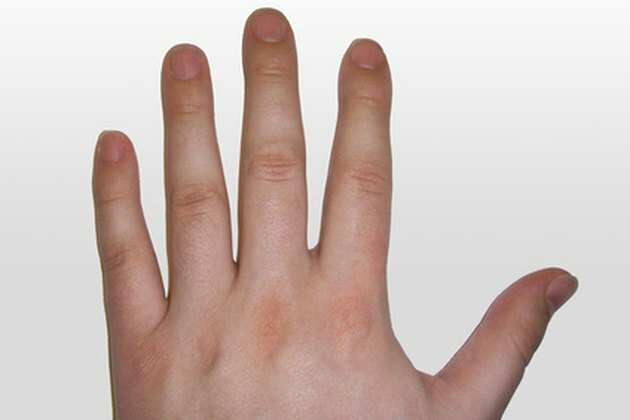 Tingling in the thumb and fingers except the little finger may indicate pressure on the median nerve. To do a nerve gliding exercise for the median nerve, hold the affected arm in front of you with your palm facing the floor and make a fist. Bend your wrist down. Bring your wrist back up straight and splay your fingers outward. Rotate your forearm so that your palm faces the ceiling. Grab the base of your thumb with your other hand and gently pull downward on your thumb. Perform a total of eight repetitions. The radial nerve is the last of the three major nerves in the arm. It runs down the thumb side of the forearm. One nerve glide exercise for the radial nerve begins standing with your affected arm out to your side as if you were holding a tray in front of your shoulder. The elbow is bent and the palm faces the ceiling. The wrist is bent, the fingers point away from you to the side and the elbow points toward the floor. Look straight ahead. Rotate your arm toward your opposite shoulder so that your elbow points slightly upward. Your palm is in front of your opposite shoulder with your palm diagonally so your fingers point up at an angle. At the same time that you rotate your arm, tilt your head in the same direction. Do three to eight reps.